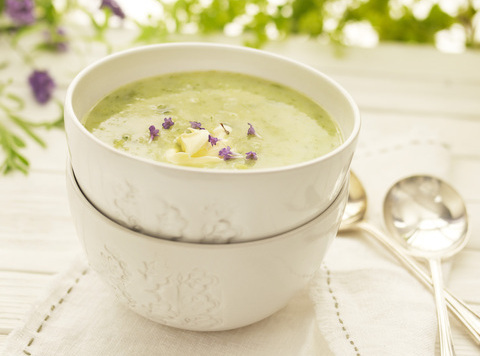 Say good bye to ordinary canned soup and say hello to Lavender Potato Soup. Toast cumin in a dry skillet over medium heat until fragrant, about 2 minutes. Transfer to a spice grinder and add the lavender. Pulse until finely ground. Add the leeks, carrots, celery, and garlic. Cook for 5 minutes, or until the leeks are soft. Add broth, potatoes, poblano peppers, chipotle pepper and lavender mixture. Tie up the peppercorns and bay leaves in cheesecloth and add to the pot. Simmer for 25 minutes, or until potatoes are tender. Remove and discard cheesecloth bundle. Use a handheld blend or a food process (work in batches) to blend soup until smooth. Season with salt and pepper & ladle into individual bowls; sprinkle with the green onions and/or extra lavender blossoms.